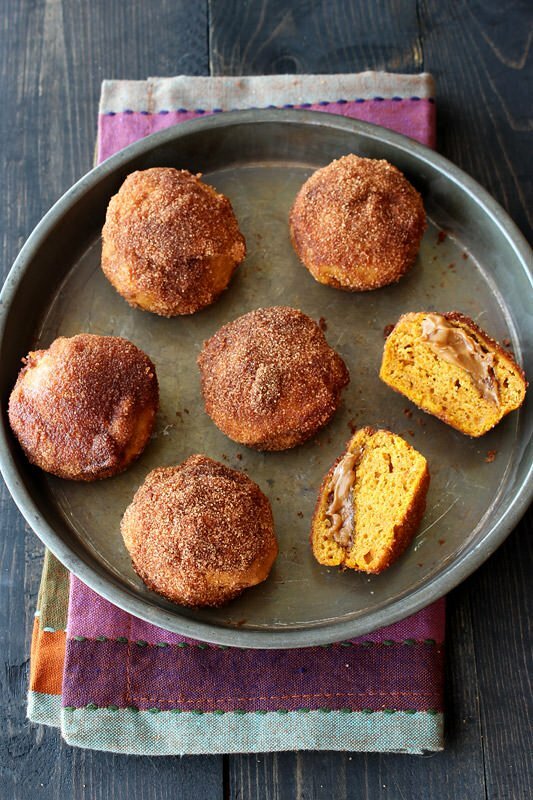 Biscoff Stuffed Pumpkin Mini Muffins are coated with cinnamon sugar and perfect for fall! Taste: Pumpkin and Biscoff were meant to be together and when you add the cinnamon sugar it’s a cinnamon overload in the best possible way. Texture: Soft and tender with a slight chew and crunch but the best part is definitely the gooey Biscoff filling. Ease: Easy, the longest part is filling the mini muffin tins with batter and Biscoff. Appearance: Aren’t these just adorable? Would I make this again? Yesss. Happy first week of fall! We’ll pretend it’s not still 90°F here in Phoenix. I keep staring longingly at all my boots and jackets, waiting for the day when it will get barely cool enough to wear them. At least it doesn’t have to be cool to justify baking pumpkin goodies, right? I’m seriously so excited to share this recipe with you. When I took my first bite of these Biscoff Stuffed Pumpkin Mini Muffins my first thought was mmmmmmmmohmygosh I have to share these on the blog ASAP! Then I proceeded to inhale a few more muffins. That’s usually a good sign! The muffins themselves are tender and soft yet still rich and bursting with spiced pumpkin goodness. I love how the cinnamon sugar coating adds a nice crunch to each bite but the Biscoff filling is seriously to die for. So good and so perfect for fall, you’ve got to try these! Preheat the oven to 350°F. Spray a mini muffin tin with nonstick baking spray. Pour 1 tablespoon of batter into each mini muffin cup. Top with a 1/2 teaspoon of Biscoff. Top with about another 1 teaspoon of batter. Combine the sugar and cinnamon in a small bowl. Dip each doughnut hole into the melted butter then coat in the cinnamon sugar. Serve. Oh my gosh, wow! These look so good! All that cinnamon sugar on top? Holy yum! These look so delicious! The combination of pumpkin with Biscoff, coated with sugar-cinnamon sounds amazing! Oh wow, these look absolutely amazing! I really have to look up if there’s any way for me to get ahold of Biscoff, cause I’d love to make these! I get it at Cost Plus World Market or Fresh & Easy. Trader Joe’s also has its own version called Cookie Butter! This is perfect for my cookie butter cravings! What fun little muffins! Love the biscoff center! What a muuuuufffin! I love these, Tessa!!! HOLY MOLY LADY! Just look at all that Biscoff goodness in there! These look and sound incredible 🙂 Although I did have to look up what Biscoff spread was. American bloggers are always taunting me with their delicious ingredients that aren’t available in the UK! Any ideas what I could use instead?